We are thrilled to announce that beloved (and mysterious) children’s author Lemony Snicket will be the kids’ keynote presenter at the ninth annual Boston Book Festival on October 28 in Copley Square. Author of the wildly popular Series of Unfortunate Events (now a Netflix original series), among many other bestselling books, Snicket will appear at the Boston Book Festival to present his latest picture book for children, The Bad Mood and the Stick, featuring art by Matthew Forsythe. This whimsical story illustrates the unexpected outcomes of one little girl’s bad mood, and Lemony Snicket’s presentation at the BBF is guaranteed to banish any bad moods from the premises! Snicket’s presentation will headline a full day of programs for children, teens, and families at the 2017 BBF. These will include story time presentations by picture book authors and illustrators, panel presentations and discussions, hands-on workshops with working artists, and much more. In 2015 and 2016, the BBF presented a standalone spring children’s festival called Hubbub. Hubbub will not continue as a standalone festival in 2017; instead, we will build on many Hubbub partnerships to expand and enhance interactive and interdisciplinary programming for children and families at the October BBF. Somerville-based children’s publisher Candlewick Press, celebrating its 25th anniversary this year, will be the Presenting Sponsor of these expanded children’s offerings, which we’re calling “Hubbub at the BBF.” Costume character meet & greets, STEAM activities, scavenger hunts, celebrations of global culture, and tons of festive fun—the whole family will discover a full day of storytelling and surprises at the BBF. We hope your family makes plans to attend Lemony Snicket’s kids’ keynote and then spend the day with us at the Boston Book Festival on October 28! Boston Book Festival is thrilled to partner with Independent Film Festival Boston (IFFBoston) for another year of independent film and storytelling! The 15th Annual IFFBoston is taking place April 26-May 3 at the Somerville Theatre, Brattle Theatre, Coolidge Corner Theatre, and UMass Boston. Over one hundred films will be shown along with nightly parties and weekend panel discussions. Tickets for all events are on sale now at http://www.iffboston.org. We are sponsoring two films this year: Edgar Allan Poe: Buried Alive and The Little Hours. For those who love his poetry and horror stories, this biographical documentary delivers a dramatic tale of Poe’s life, focusing on his career, personal life, and mysterious disappearance before his death. Poe is played by Denis O’Hare (True Blood, The Good Wife, American Horror Story), who delivers a satisfyingly intense performance, including readings of Poe’s literature and criticism. 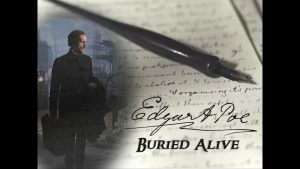 For more information, check the IFF website: Edgar Allan Poe: Buried Alive. This movie is not for the faint of heart! It is a racy, mature take on the fourteenth-century author Giovanni Boccaccio’s The Decameron, a collection of tales about a medieval Italian nunnery. With a star-studded comedic cast (Alison Brie, Dave Franco, Fred Armisen, John C. Reilly, Aubrey Plaza, Molly Shannon), get ready for an unapologetic rendition of lust and laughter. More details here: The Little Hours. We hope you’ll join us for one of these literary-inspired movies! Please check out the full IFF lineup here to find additional screenings. From film to books, we love good storytelling and are happy to support IFFBoston in our shared mission of bringing Boston together through great art. We hope to see you there!